"The Complete Rock Konducta Experience, presented Here As A Double-CD Issue, Featuring 48 Untitled Tracks Across 2 CDs. Madlib’s Rock Konducta – the blatantly titled, rock-inspired entry in the producer’s long-running Beat Konducta instrumental series. Madlib announced his Rock Konducta album with a limited edition 45 made specifically for sale at the Zamrock Live! Madlib Medicine Show in San Francisco in early 2013. It was a fitting place to make the debut, as his previous Beat Konducta in Africa album was heavily inspired by Africa’s vibrant 70s rock scene, with a specific focus on Zambia’s Zamrock. Rock Konducta is the fifth installment in Madlib’s Beat Konducta series. Previous entries include: Beat Konducta : Movie Scenes, Beat Konducta: in India, Beat Konducta: Dil Cosby and Dil Withers Suites and Beat Konducta in Africa. Rock Konducta grabs its source material from various worldwide rock scenes from the 60s through the 80s, from American psychedelia to Germany’s krautrock to acid-soaked Spanish prog to synthy, early-80s oddities. 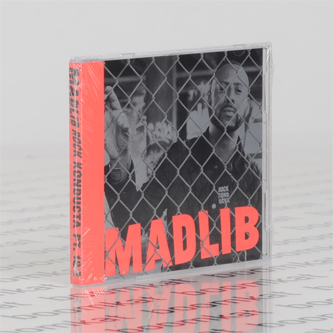 Tied together by Madlib’s unique sensibility, these scenes coalesce into a new whole. Who knew that rock music sounded like this? Well, there’s one obvious answer to that question."